How much does it cost to travel to Fiji? How much money will you need in Fiji? FJ$310 ($145) is the average daily price for traveling in Fiji. The average price of food for one day is FJ$70 ($33). The average price of a hotel for a couple is FJ$378 ($177). Additional pricing is in the table below. These average travel prices have been collected from other travelers to help you plan your own travel budget. Fiji is located about two-thirds of the way between Hawaii and New Zealand. It is an archipelago that includes 332 islands, the largest few making up most of the land area, and approximately 110 of which are inhabited. The islands of Fiji are formed by volcanic mountains and surrounded by warm tropical waters. There are beautiful coral reefs that serve as a major attraction for tourists. The islands also have tropical rainforests, coconut plantations, impressive beaches, and rolling hills. The country enjoys a tropical marine climate with just slight temperature variations throughout the year. Between the months of November and April the area is most prone to tropical cyclonic storms (essentially hurricanes). The country's terrain is mostly mountainous do to the country's volcanic origin. There are remote villages sprinkled throughout the interiors and buses travel the roads that pass through the mountains of Vanua Levu and Viti Levu. Fiji is divided into nine groups of islands. These include Viti Levu, which is the largest and most significant island. It serves as home to the majority of the inhabitants. It is also the most economically developed. Vanua Levu is the second largest island and the third is Taveuni. The Yasawa Islands are a popular destination for vacationers and Rotuma is one of the most remote. It is also home to a different Polynesian ethnic group. Other regions include Kadavu, Mamanuca Islands, Lomaiviti Islands, and Lau Islands. 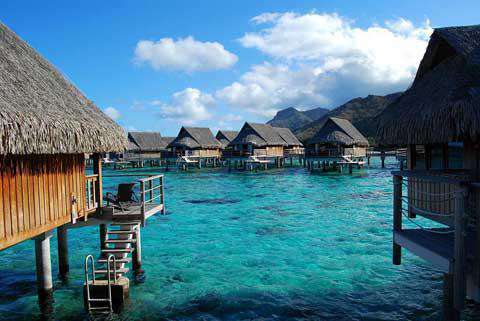 Fiji is a very popular destination for honeymooning. It's consider a romantic place to visit and there are a decent number of adult-only and couple-only resorts. These resorts are usually smaller and located in isolated areas that are beautiful and peaceful. Alternatively, there are some family friendly resorts that offer activities for kids. Kids clubs let parents have a break and some resorts even offer nanny services. If you're on a budget there are some good options available in Fiji. On the Mamanuca and Yasawa Island chains there are a range of budget friendly resorts. You can access these islands by Port Denarau on Denarau Island where there is a ferry service that loops through the region. Alternatively, you might consider the Coral Coast on the southern coast of Viti Levu. This is easily accessible from Nadi International Airport and there you will find some budget options. Fiji's official language is English and it is spoken by most people in the major tourist areas. If you're visiting a less touristy island, fluent English speakers may be less common. Fijian or Hindustani is spoken by most adults and children so it is worthwhile to learn a few key phrases. The currency of Fiji is the Fijian Dollar. Inflation is relatively high so prices can be comparable to those found in Australia, at least in the tourist regions. Souvenirs can be bought in local markets, but do be aware that the stall holders may be aggressive. If you don't want to buy an item, stand firm and resist. If necessary, you can threaten to report them to the authorities. There are plenty of outdoor activities which you can enjoy in Fiji. Some popular adventure sports include whitewater rafting, kayaking, skydiving, and hiking. And of course, snorkeling and scuba diving are favorites as well. Mamanuca Islands: The Mamanuca Islands are located just to the west of Nadi and to the south of the Yasawa Islands. There are about 20 islands in total, but 7 disappear with the high tide. The water around the islands is crystal clear and the beaches are lined with palm trees and coral reefs. Navala Village: Make sure you visit this unique thatched roof village. Located in the Ba Highlands of north-central Viti Levu, this village is known for its thatched buildings. There are over 200 thatched huts, making this village one of the only remaining Fijian settlements that has completely traditional architecture. Bouma National Park: Located on Taveuni, this national park protects over 80% of the total area of the island and includes rainforest and coastal forest. There are three Tavoro Waterfalls near the visitor center and each has its own natural swimming pool. Cafes and small restaurants are found throughout Fiji. Meals can be surprisingly affordable if you go where the locals go. The food can vary in quality, but choose made-to-order dishes if you want the freshest ingredients. In addition to Fijian cuisine, you may also find Chinese or Indian options. Paulsami: This dish is made with baked taro leaves that are marinated in lemon juice and coconut milk. They are prepared with a meat or fish filling that is seasoned with a small amount of onion or garlic. Kokoda: This popular Fijian dish is essential a raw fish salad. It is made with either fish or some other form of seafood that is marinated in lemon and coconut milk. Lovo: This is a cooking style that involves roasting food in the ground. A pit oven is used to slow roast meat or vegetables until they are flavorful.